AbleWord is a very capable word processing application that can read and write most popular document formats including PDF's. It is fully featured, supporting image formatting, tables, headers & footers and includes spell checking and print preview functions. Best of all it is totally free even for commercial use. 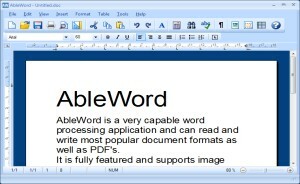 There are a few free Word Processing packages available for Windows but none come close to the features offered by AbleWord. It is highly compatible with popular document formats including .DOC & .DOCX but Ableword can also open and save as a PDF which makes it a very useful tool to have. AbleWord very simple to install and use, it is commonly used as a PDF Editor and also for converting PDF to Word® but of course it is also a splendid Word processor and supports most of Microsoft Word® features. For more information see our getting started guide or online help. v3.0 released. Faster PDF loading. 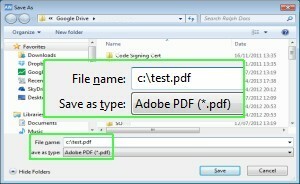 Ability to import PDF Text only. v2.0 released. Now includes PDF read/write ability and spell checking. v1.6 released. 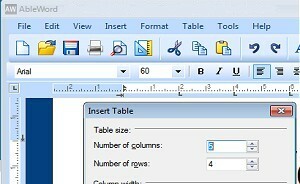 HTML import/export, fixes to Docx table formatting.